This semester, freshmen in the College of Business experienced an excellent, hands-on opportunity to practice and enhance their professional skills. The college organized an event where students new to the world of business learned how to present themselves in professional situations, received tips on professional dinner manners, and made connections with some of the college’s board members and alumni. Promoting a culture of excellence, the College of Business conducted its traditional Student Etiquette Dinner Oct. 1. The event was open to all freshmen enrolled in the Foundations of Inquiry for Business (UCOL 101B) course. The event gave students the opportunity to receive expert advice on networking and business etiquette, as well as the chance to become more comfortable and confident in professional and interview situations. 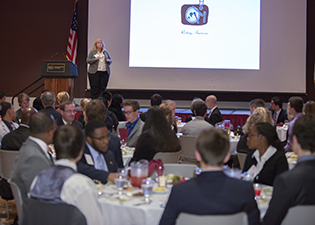 The dinner, which took place in the ballrooms of the SIU Student Center, attracted nearly 200 attendees, including board members, event sponsors, campus guests, and College of Business faculty, staff, students and alumni. All of the students were required to make timely reservations and to wear professional business attire. The evening started with a networking reception, followed by dinner provided by Mary’s Fine Dining. The etiquette training was delivered by Melenie Broyles of Etiquette St. Louis, who provided students with etiquette instructions in a professional, but also fun and engaging, manner. Broyles has more than 10 years of experience with such events, and she finds a way to incorporate humor into her professional training events. The event was generously supported by the College of Business advisory board, alumni and corporate sponsors. The students attending the etiquette dinner event expressed their appreciation to the alumni and board members who made this opportunity available to them. The college extends its gratitude to all who contributed to making this a successful event.